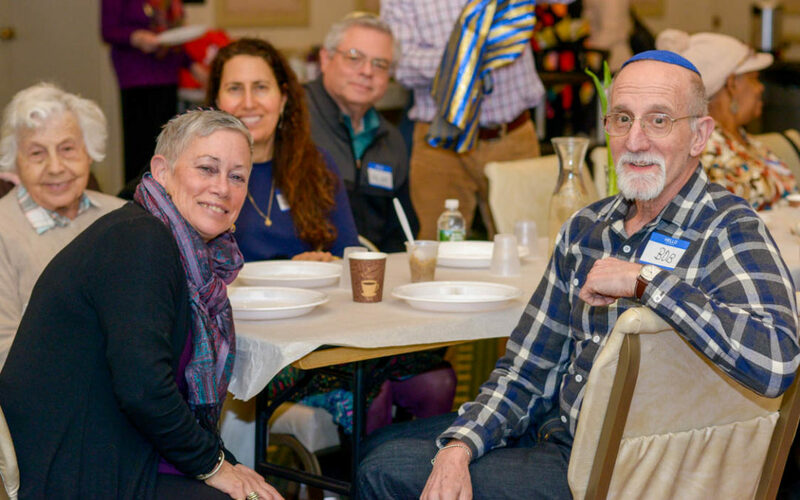 The Memory Minyan is a model of community and Jewish spirituality serving people with dementia and their friends and families. While the Memory Minyan is one of Seivah’s signature programs, we didn’t invent the format. Rather, we adapted it from a concept called the Memory Café, created in Holland in the 1990’s by a Dutch geriatric psychologist named Bere Meisen. Troubled by the social isolation his clients with dementia experienced, Meisen envisioned a meeting place where people with mild to mid-stage dementia and their caregivers can “go out on the town” among others sharing their condition, free from the risk of embarrassment and the bewildering crush of most public places. Since the 1990’s, Memory Cafés have sprung up around the world, bringing a sense of normalcy and social connection to thousands of families affected by dementia. Seivah’s innovation to the Memory Café formula was really quite minimal. We merely situated it in a synagogue, added traditional Jewish songs and prayers, plus a certain Jewish sensibility: always have food available, and don’t make people wait to eat it. Sooner than I imagined possible, last week I joined in Seivah’s first Memory Minyan outside Westchester. We assembled in the Rodeph Sholom Board Room. It was a perfect space: portraits adorning oak paneled walls conferred a sense of dignity; plates of cookies on bright table cloths conveyed comfort. Around this table were gathered friends, family, volunteers, and home health aides, along with Rabbi Karol, myself, and guitarist Koby Hayon. We sang songs — some from song sheets, others spontaneous. We ate and exchanged words of gratitude. If someone wanted to get up and pace about the room, it was okay. If someone didn’t finish a sentence, that was okay, too; we thanked them for their feelings. Being part of this Memory Minyan lgave me an almost fparental satisfaction: one of Seivah’s programs had grown up and created a new program of its own. –Last week, as Seivah’s Director, I conducted a staff training for the Edith and Carl Marks Jewish Community House, in Bensonhurst, Brooklyn. The Marks JCH engaged Seivah to help create programs to deliver comfort, meaning, respite, and joy to its Russian-speaking families struggling with dementia. –This week I’ll bring Seivah-inspired techniques to a program at Riverside Church in Manhattan. –On July 30th, I’ll meet with Temple Shaaray Tefila members in Bedford because a congregant there had taken her mother to our Memory Minyan at New Rochelle’s Beth El Synagogue and decided that there needed to be a similar program up north. Thanks to a grant from UJA-Federation, Seivah will be able to create a whole array of dementia-related programs at Shaaray Tefila. –Since May, Shaarei Tikvah Synagogue in Scarsdale has been the home of a Seivah/WJCS music program, run by a Seivah volunteer who is a Shaarei Tikvah congregant. –In October, we will be partnering with WJCS at the First Methodist Church in Mt.Vernon to help them create their own version of the Memory Minyan and Care Buddies programs. I am proud to have created Seivah’s first Memory Minyan in Westchester. I feel an even deeper satisfaction from having created dementia programs which can be propagated in other communities. From its beginnings, Seivah has been not just a single service provider, but a resource empowering sibling institutions and individuals, both Jewish and otherwise, to create their own models of care for people affected by dementia. “Hineh mah tov” indeed. How good and pleasant it is to join together as siblings. Small world indeed!